With a bit of basic knowledge you can significantly enhance your two wheeled, human-powered experience. You can go further, maybe faster, certainly easier, and really enjoy yourself. And get fitter, quicker too. The pedals on "penny farthings" or Ordinaries as they were known, were directly attached to the front wheel - one rotation of the pedals resulted therefore in one revolution of the front wheel - the larger the front wheel the further you went per pedal stroke. So people with long legs could have a bigger front wheel, which gave them a larger gear as they'd go further per pedal stroke - the distance along the road equating to the circumference of the wheel. James Starley invented the chain-drive "Safety" bicycle which featured two wheels of the same size, with the rear one connected by a chain to the pedals by a chain. The chain wheel - the cog directly attached to the pedals - was a different size to the cog on the rear wheel. So, although there was only one gear, the gear could take the bike further, or less far, than a wheel circumference per pedal stroke, depending on the ratio of the sizes of these two cogs. This made the bike into a more efficient machine. Derailleurs were invented to provide a way to give racing cyclists the ability to maintain a constant cadence, or rate of pedaling, over variable terrain; bigger gears for going downhill to maximise the advantage and lower gears to assist hill climbing. Improvements in technology and materials in recent years has lead to a massive increase in the number of gears available to the cyclist. A modern mountain bike can offer 27 gear combinations, with a triple chain ring and nine cogs on the rear block. Road bikes, with a double chain ring and nine cogs on the block offer 18 gears. Frame geometry has had to change as a result, with rear triangles becoming wider, with flaired chain and seat stays, to accommodate the increase in width caused by these super-wide blocks. But there's a penalty for all this choice; 27 or 18 combinations doesn't mean that the rider has 27 or 18 different gears because of the overlap of ratios (see diag). There are two setups illustrated - a typical mountain bike and a typical road racing bike. 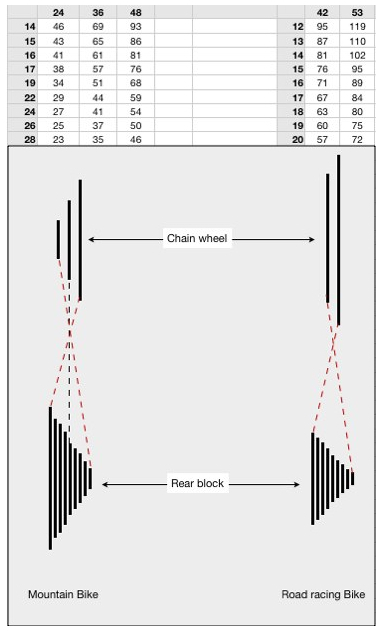 The table show the individual gear ratios, in bold on the left side of the tables are the rear cogs and along to top in bold the chain rings, a triple for the mountain bike and a double for the road bike. Although we're talking about ratios, which are unit-less, in cycling terms we refer to these as a given number of inches. It's a bit lazy and is a hangover from the days of the penny farthing. In the body of the table you'll see a grid of numbers, each on the distance along the road travelled for one revolution of the pedals in that gear. The larger the chainwheel and the smaller the rear sprocket, the larger the gear; conversely the smaller the chainwheel and the larger the rear sprocket, the smaller the gear. So the lowest gear on the mountain bike will take you 23 inches per pedal revolution, the lowest gear on the road bike 57 inches. Largest are 93 and 199 respectively. Mechanically you shouldn't really use small-on-small or large-on-large as the chain cuts across at a very wide angle which increases wear on chain, chainwheels and rear cogs. How to decide which gear to use when? To start with it's a little bit of trial and error. As general guide, on flat terrain, you need to be pedaling briskly against some resistance. Too small a gear and you're spinning quickly without making much forward progress and wasting energy, too high a gear and your straining and simply tiring yourself out. In both cases you look silly. So try a few gears and see how you get on. Once you've got what feels like the most comfortable, figure out the gear ratio. To work this out you simply divide the number of teeth on the chain wheel by the number of teeth on the rear sprocket and multiply by 27. From here you'll be able to work out what the next best gears are either side of the most comfortable one, and so on to the rest of the gears available. If you cycle regularly, you'll soon become fit enough for the original most comfortable gear to feel too low. But the next gear up may be too high because the jump is size of the next sprocket is too large to provide a good next gear. In which case you'll have to get a block custom made - an easy enough job for a quality bike shop. With mountain bikes the jumps between gears are quite large anyway, to cope with the rapid changes of pitch of the terrain - which doesn't alter as rapidly on a tarmac'ed road. So a mountain bike gear set up isn't the best for use on the road, and a road gear set up isn't the best for use off road because the gear ratios are too close together. So, get the bike you want to suit the kind of riding you'll be doing, on-road or off road and really focus on the gears you're using. If you're pedalling uncomfortably fast, or seem to be pushing against massive weights, you're in the wrong gear.